On the Water Conserve portal I found this highly disturbing post from Dr Glenn Barry. He cites the United Nations' Millennium Project as saying the world's water is running out as there are 'no more rivers to take water from'. This is also the outcome as displayed by the hydrological cycle, flowing from sea to sky, from fresh to salt. The water is held within this cycle; it moves from rain to sleet and snow; it runs through rivers to oceans and back to rain, sleet and snow. 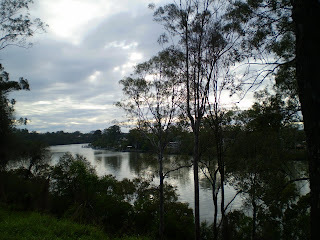 Looking at the river in Brisbane it's hard to fathom that the flow could ever cease. In the bigger picture the river is playing its vital role in sustaining the viabilty and vitality of ecosystem services. I remember being in Yirrkala in Northeast Arnhemland a few years ago and going to watch a class at the local community school about the water cycle. The Yolngu children were first taught by the non-Aboriginal teacher in English, and in a western scientific paradigm about the watery interconnections. Then we climbed into the school bus and went to visit an elder couple who taught the children the manikay or sacred songs about the flourishing of weather and the movement of waters. This is an example of the 'both ways' education in operation; it is an inspirational approach that parallels the practical psycho-philosophical worldview that pervades this north Australian community. Sitting on the beach the women, teachers at the school, shared their knowledge about how the exchange of salt and fresh water through the movement of the tides acts as a life-affirming and vital metaphor for living and sharing in this community. The metaphor of 'ganma' sits within the flowing waters as a foundational principle. It refers to the swirling of river and ocean flows that meet and merge in the tidal lagoon. In metaphorical terms, ganma refers to the interlinking of western and indigenous knowledge systems where the interflowing sea water represents western knowledge, and the outerflowing river-land water represents indigenous knowledge. The waters move, flow over, overflow together, enjoined as one. This concept represents a deeper understanding, a deeper truth, where the place of interconnecting waters is likened to the place of interconnecting peoples, to the flowing together of people with country. Both ways is the guiding principle for what could be. It links. It brings together. It acts. It reconciles. It flows as one. If you would like to add a comment, please click on 'Comments' below.